It’s a brand new year and we hope everyone’s January started off safe and sound with great new plans for the rest of the year. For those of you who observe the Chinese New Year, the Year of the Monkey is right around the corner, kicking off on February 7 (New Year’s Eve, Feb. 8 is New Year’s Day) and going on through February 13. Many of you may be making plans for that home, kitchen or bathroom remodel you’ve been putting off for the last couple of years. Perhaps 2016 is the year you put those remodeling plans into motion. If so, this issue has several great projects to give you some ideas from several home remodelers who have been doing it for a long time. Click on the cover image to be taken to Hawaii Home & Garden magazine issue 4 for viewing or download. 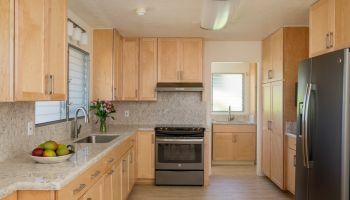 To kick off this issue, Homeowners Design Center helped a local personality plan the remodel of her Hawaii Kai kitchen, with a fabulous view of Diamond Head. After seeing kitchen remodeler and designer Randall Omoto at one of his remodeling seminars, she attended another one of his seminars and knew she found the design experts to help her with her project. INSOLID, experts in seamless solid surface products for the kitchen and bathroom, also specialize in remodeling bathrooms with aging-in-place features, even when you don’t need them right away. In this issue’s featured project, they help a younger couple create a new bathroom addition with aging-in-place preparations, making the space and shower wheelchair accessible with no curb. Owner Scott Allen praises solid surface’s versatility in helping to design the new bathroom this way. Young family preps a shower for aging in place by making it wheelchair accessible. Click on the photo to learn more about INSOLID. Finally, if you’re a lover of wine, you more than likely wish you had a great place to store them. 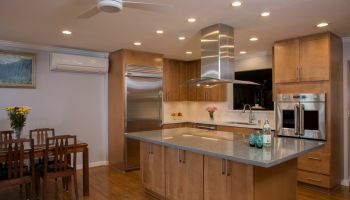 Kailua-based countertop and custom cabinet experts Hawaii Kitchen & Bath and Deb Cullison of Deborah Cullison Designs was able to help one local wine lover create just that. A delightful custom cabinet wine center, housing a wine refrigerator where the happy homeowner can store his cherished collection for years to come. Custom cabinets designed to house a wine refrigerator and bottles of the good stuff. Click on the photo to learn more about Hawaii Kitchen & Bath. Because of the popularity of our gift card giveaway, we’re doing it again to kick-off the new year, and in honor of Chinese New Year, this time we’re giving one lucky winner $50 in gift certificates to the Little Village Noodle House. If you’ve never eaten there, it’s worth entering the contest to try and win these gift certificates. We also want to congratulate the issue 3 winners, Lynda Takara of Honolulu and Judith Aboud of Kaaawa! Please click here to see the contest rules and regulations. Click here to watch the video with the answer to the contest question. Good luck! And kung hee fat choy!